Good food, great connections and expert advice on the 2019’s employment laws hot topics.…all in a FREE 2 hour ‘Working Lunch’. 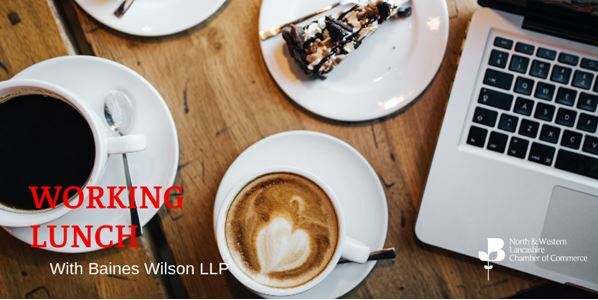 On 30th April, The North & Western Lancashire Chamber of Commerce in partnership with Baines Wilson LLP would like to invite you to the first ‘Working Lunch’ event of 2019. The event will be run by Caroline Rayner, an Employment Law Partner at Baines Wilson LLP. “In an interactive and engaging session, Caroline will explore the Hot Topics for 2019 that employers need to know. Topics that will be covered will include social media, #MeToo, employment status, a legislation update and a roundup of the most important cases of 2019″. Employment law is ever-changing – come along and find out what’s in, what’s out, what’s old and what’s new and most importantly what you absolutely have to do as an employer in this informative session. This invaluable event will include a buffet style lunch in order to facilitate networking and provide you with some key information to take back to your business. It’s also a great opportunity to meet other business people from the Lancashire area and expand your professional network. This event has limited places and is anticipated to sell out, so make sure you book as soon as possible to avoid disappointment.